When Air Products Canada Limited had to engineer a solution for the foundation piles on their Hydrogen facility in Fort Saskatchewan, the soft, sandy sub-surface soil conditions on site created a big challenge for the design team. With the proposed start date for piling getting closer and potentially forcing them to start behind schedule, they were tasked with finding the money and the resources to produce 925 Belled Cast-in-Place (CIP) piles – a daunting project for any company. Feeling the pressure of a complicated job, specialist sub-contractor Keller Canada was recommended to them as a resource. While Air Products wasn’t sure how their plan could change, involving Keller Canada in the early design stage provided surprising results. A deep understanding of the soil conditions was integral to finding the right solution for the job. With problematic sub-surface soil, Air Products knew they needed an alternate solution to prevent their piles from collapsing inward. The original Belled CIP pile design required a significant amount of temporary casing to control the difficult strata on site, introducing big costs and potential schedule delays. Though Air Products believed that large amounts of time and effort would be needed to finish the job, Keller Canada was interested to see if there was an easier way. Keller Canada Senior Project Manager Matt Ramsden, along with Project Manager Barry Evans and Superintendent Dwight Hebert, all have significant experience with Continuous Flight Auger (CFA) piling in difficult soils, and knew this technology had the potential to be a massive time and money saver for the project. 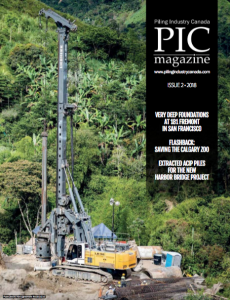 By collaborating with Air Products’ engineers, they looked deeper into the feasibility of CFA piling on site by installing test piles to confirm their design criteria. Performing a test pile program with geotechnical engineers allowed the team to gain valuable insight into the geotechnical performance of the subsurface soils, and they were able to validate their design recommendations for its conditions. Along with the fact that CFA piles would perform just as well as Belled CIP piles, they had the added attractive benefits of dramatically reducing costs and saving precious schedule time. 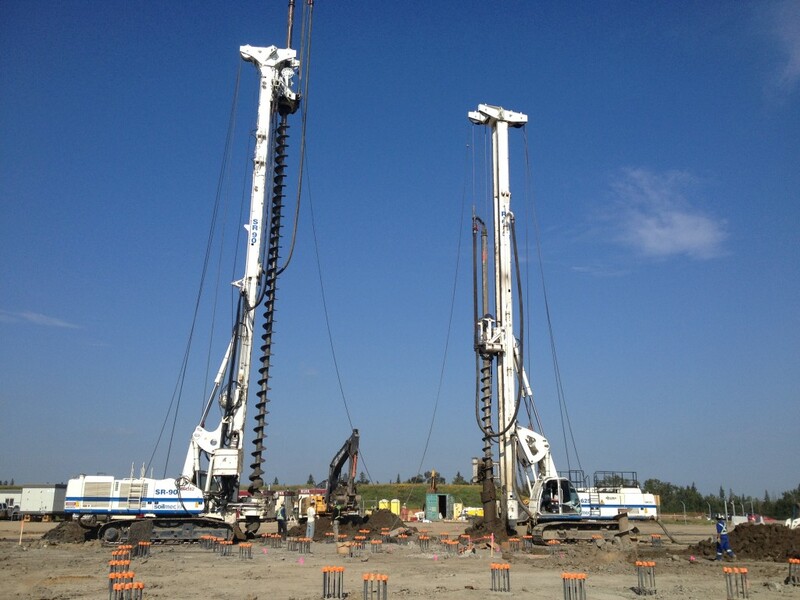 As an additional benefit, Air Products’ initial estimation for on time completion of Belled CIP piles required 14 rigs, which was drastically revised down to only two rigs by Keller Canada for CFA pile installation. Though Air Products was initially unsure if two rigs could complete the CFA piles under a tight deadline, the relationship they had developed with Keller Canada meant they trusted them enough to give their plan a shot. The Keller Canada project team maintains that much of the success of their working relationship stemmed from the openness of Air Products to collaborate with them early on in the process, allowing them to revise their initial plan. Trusting Keller Canada to work with them on plans before the project even started ultimately boosted productivity while giving Air Products the best bang for their buck. According to recent industry studies, a large portion of all major industrial projects end up significantly over budget and over schedule. For Canada to attract capital and convince owners to build their industrial projects here, owners, engineers, and contractors have the potential to benefit greatly from adopting this collaborative method of project delivery. With a little foresight into the design process, owners can enable innovation, optimize design, reduce costs, and control schedules, improving overall project execution. They say an ounce of prevention is worth a pound of cure, and in this case, the small step of getting a capable contractor engaged early allowed a company to capitalize on innovation and recognize significant cost savings, effectively mitigating any problems along the way. 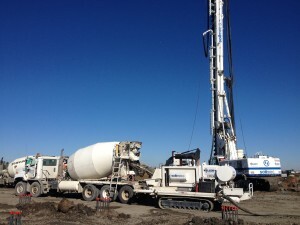 Backed by the largest independent ground engineering company in the world, Keller Canada prides itself in being able to provide full-service geotechnical solutions for any job, no matter what challenges get in the way. Formerly North American Caisson Ltd., a division of North American Construction Group, Keller Canada was acquired by U.K.-based company Keller Group Plc. in 2013, though their management and operations remain the same. With over 30 years of experience piling in Canada’s soil, Keller Canada provides safe, high-quality solutions with hands on experience in all climates, project environments, and soil conditions.